Before I moved out to California I had a very different impression of Mexican food, specifically tacos, a family favorite when I was growing up. We often had tacos for dinner, but we were eating what I later learned was the “Americanized taco”, U-shaped crispy corn shells filled with ground beef (seasoned with a packet of taco seasoning) and topped with cheese, salsa, black olives, tomatoes, cheese and sometimes sour cream: essentially a homemade “supreme” taco from Taco Bell. They were/are delicious. But my wife (then girlfriend) tried to convince me that my idea of tacos was completely wrong. She told me that “traditional” tacos were only meat, onions and cilantro. It was the one and only time she’s ever been right. 1. Preheat oven to 400 degrees. Line 2 baking sheets with tinfoil and place 4 corn tortillas on each. Spray the tortillas with cooking spray, sprinkle with salt and place in the oven for 4 minutes. Remove trays, flip the tortillas, and place the cheese down the middle, if using. Place back in the oven for 3-4 minutes. 2. Heat a skillet on medium-high heat. Chop the meat into bite-sized pieces or chunks. Spray the skillet with cooking spray and add the meat. Add the cumin, chili powder and paprika in a ratio of about 2:2:1 to taste, but the more the merrier. Add salt and cayenne or chipotle pepper powder to taste. Cook the meat, stirring occasionally for about 3-4 minutes until browned and cooked through. 3. Remove the tortillas from the oven and top with meat, beans and cilantro. Add additional toppings (my favorites are cheese, salsa, sour cream, black olives and peaches). 4. If you’ve never had this type of taco before you might want to take a seat first, prepare to be blown away. This is a great meal that you can almost always have on hand. I always keep dried or canned beans on hand, corn tortillas in the cabinet (they last for a while) and usually have salsa and cheese around. You can also omit the meat for a bean taco, you might not even notice the difference. I’m glad that I have taught you something about food! And to think that you didn’t believe me! I am grateful that I have gotten you so into Mexican food, because I miss my Nana’s beans so much but you have surprisingly come very close to her beans! I love you… and see… i do read your blog! Eli, I imagine the best part for you, besides having a wonderful boyfriend, is that you get free delicious food. The compliment about cooking so closely to your Nana’s recipe means a lot, thank you girl. I don’t like Mexican food. However, this look yum. Oooh, that toffee pb sounds divine. That looks like an amazing mexican dish. Thanks for sharing. I will have to look into getting some of that PB. It sounds delicious! Snooky Doodle, It’s really easy. You can be eating within literally 15 minutes. Erin, You don’t like Mexican food! But it’s so delicious and healthy! What with the lean meat (protein), beans (protein/fiber), cheese (nonfat and for protein), salsa (veggies) and corn tortillas (whole grain), you’ve got a complete meal in your hands! Zesty, Simple and delicious, let me know how it works out for ya. Nick, thanks for stopping by my blog! Those pitas are stuffable, they are from Trader Joes. I am in love with them! Thanks for visiting my blog! I love the origin of your blog title — everyone needs a superhero name! 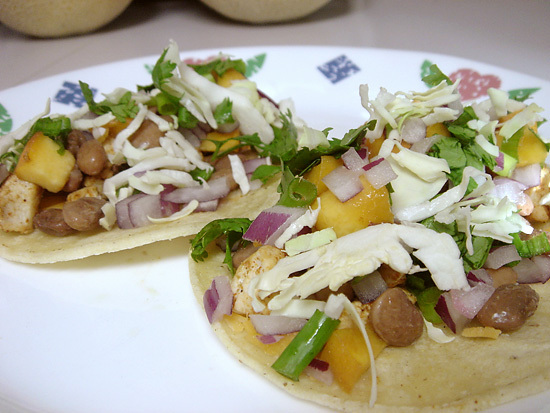 These tacos look lovely – I love the optional mango garnish before. I love including sweet things in savory dishes. It took me awhile to warm up to corn tortillas, too, but now a good authentic taco and a margarita is better than just about anything! Mmmm tacos. Thanks for the reminder that I am in desperate need of making some! Mexican food is wonderful. peanut butter toffee..sounds too good to be true! Mexican food is one cuisine I sadly admit I know really nothing about. This looks very interesting and good for you too. hi my peanut butter boy… uhm… the taco is not the only key thing to making a good taco. if the meat is not right, oh my goodness, this girl is NOT happy! :) urs look good, but y do the beans look like u tried to mask peanut butter balls :)!!! :) I’m needing to have some guac now! Heather, Oooh, don’t even get me started on margaritas. I make em soooo good, I gotta post that too. Dee, I can’t even describe how good these are, specifically because of the tortilla texture. Marlow, That’s what I thought too. This stuff proved me wrong. Super healthy too. Giz, It’s quite well rounded and nutritious. A very complete meal in a small package. Oh, and delicious too! Bren, Yea, maybe there’s some way we can fix Erin? Haha, no peanut butter balls in there, that’s the meat which of course has seasoning! Without it you have nothing! I use salt, cumin, chili powder, paprika and chipotle chili powder. And I certainly don’t skimp on them either. That looks great! I almost had tacos tonight too lol. I love authentic and Americanized Mexican food, too! Grew up eating tacos with the corn tortillas, my mom always fried them in 1/4 inch of oil or so for just a short time, so they were still bendy, but tasty. Loved em. Great post! Cute chat with the girlfriend over to the left here. First time visiting and I am happy to know that people know there is a huge difference between americanized mexican food and authentic. I am mexican and let me give you some advice with that corn tortilla. I am very picky about corn tortillas I happen to live close to the border so my dad brings us mexican corn tortillas quite often because we don’t like the ones from here (South Texas) or they sell them too expensive. Anyway, it might not be too healthy but try frying the tortilla in vegetable oil. That usually tends to make any tortilla taste similar to the authentic ones. When I say fry, I mean leave it in the oil for about a minute or so, making sure the tortilla stays soft. If you are interested, I can share some of my family’s recipes. Yes, that is a delicious way to prepare the tortillas, especially with the fresh made corn tortillas. I have never fried them in oil (and it can’t be terribly healthy) but I’ll give it a try next time for sure! I’d love some traditional Mexican recipes, got any favorites to share? You can submit them directly to me via the Recipe Submission Form.